Description Mounted on cardboard. Pin holes, corner cut off, creases, stains. Label: Knotts' Hopyard (ca. 1899? ), Pickers. Faded. Accompanying piece of paper: Labelled on Back: Anderson(? ), Blanken(? ), -; Anderson, Anderson, -, Galbert(? ), Shaver, Lottie(?) Galbert(? ), Mr(? )______, Martha, Arthur Shaver(? ), Minnie Galbert, Gertie, Della S., Blanken(? 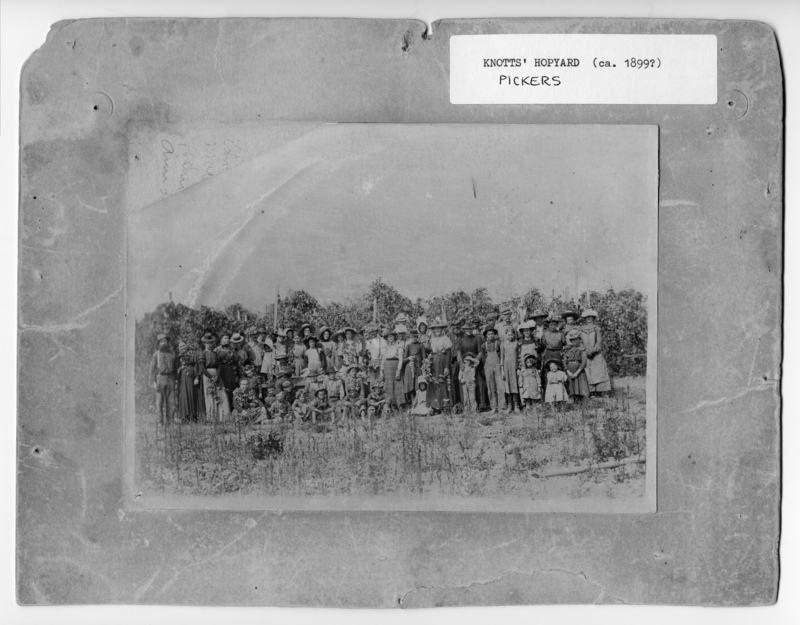 ), Mrs. Knotts, Effie Anderson, Blanken, Frank Anderson, Arthur Anderson, Vera Knotts, Mrs. Add..., Mr. Albert ______, Mr.(?)Galbert(? ), Edna, Mabel, Poelina(? ), Anna, Knott's Hopyard. Physical Description H 7.75" x W 10"